Unlike crabs and shrimp, lobsters have long bodies and muscular tails. 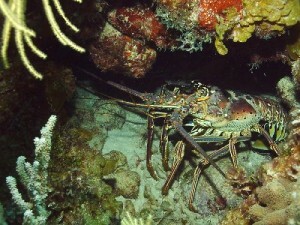 It is estimated that lobsters can live up to 60 years old, though determining the age of a lobster is challenging. Lobsters inhabit every ocean in the world. They are found on rocky, sandy or muddy ocean floors – from coastlines to open ocean. They use their 5 pairs of legs to walk on the sea floor, though they are capable of swimming by curling and uncurling their abdomen. Lobsters are omnivores – their diet consists of prey such as fish, mollusks, crustaceans, worms and some plants. Lobster consumption was originally considered to be an indication of poverty in Maine, Massachusetts and the Canadian Maritimes. Lobster was also commonly served in prisons, to the distaste of inmates. It wasn’t until the mid 19th century that New Yorkers and Bostonians began to develop a taste for it. Today, lobsters are commercially important species and are fished around the world. There are legal restrictions that apply to lobster fishing in many parts of the world, such as preventing fisherman from taking pregnant female lobsters (pictured below). 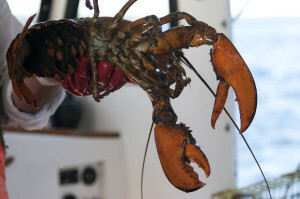 This helps to prevent lobster populations from declining.